He'll be so excited when he opens this gift. Take one look at this simple and beautiful watch and you know it's true. I love the striking contrast of brushed stainless-steel against the dark blue dial. It's nicely accented with the black leather band. The date is shown at the 3 position. Roman numerals are on the dial at the 6, 9 and 12 position. It has hands for hour, minute and second. The water resistance rating is only 30 meters (99 feet), so it should not be submerged under water. It's dressy enough to be worn out on the town, but simple enough for everyday use. 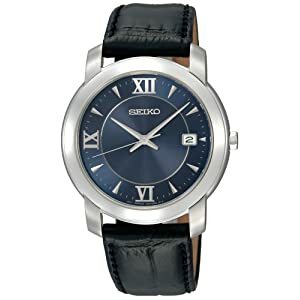 Overall this is a very elegant looking watch at a reasonable price.